Radiant floor heating is one of the most comfortable ways to heat your home. At DESCO Services, we pair radiant heating with a high efficiency boiler so that you receive the best comfort and efficiency you can achieve through a residential heating system. We fully install and service all radiant floor heat systems. Another advantage is that we supply all the parts and components needed for repair. In floor heating is made possible by running polyethylene tubing beneath the floors in your home. The process allows your floors to become heated, thus allowing a more uniform temperature across the entire space. It feels warm to your feet, warm to your body and eliminates the unevenness typically felt with forced air system. It is a better long term investment that will bring you a payback in years to come. It does not allow you to lose heat through your ceiling and will only permit a one to two-degree temperature swing from ceiling to floor. It provides a more even temperature throughout the home. It allows you to control the temperature in each room of the house. Radiant floor heat is one of the more expensive forms of heating to have installed. In response, DESCO Services offers a do-it-yourself option to help minimize the cost. 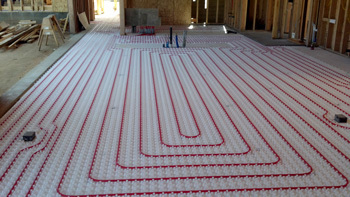 When it comes to your home, there is no better choice than in floor radiant heating. It is able to distribute heat evenly while heating mass objects instead of heating the air. With in floor heating, everything will always be warm inside your home. Contact DESCO Services today at 717-846-3384 or 717-637-2216 or 717-337-3053.